Being a digital nomad means having the freedom to pursue a career without being tied down to a desk. 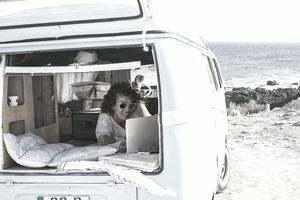 Digital nomads include freelancers, independent contractors and employees who prefer remote work to an office cubicle. When you're living on the road full-time or close to it, there are some important financial considerations to weigh in the balance. Here's how to manage your money while pursuing the digital nomad lifestyle. A budget is something everyone needs to have but it can be even more important for digital nomads, especially if travel costs account for a large chunk of your expenses or your income is irregular. There are two basic elements to your budget: what you earn and what you spend. Start with your income. If you're freelancing or you run a business as a digital nomad, your income may not be consistent from month to month. Look at what you've earned over the last 12 months and use your lowest month's income as the baseline for your budget. This can help you plan your expenses so you don't run the risk of overspending. And in months when your income is higher, you can adjust your spending accordingly and add to your savings. Next, look at your essential expenses each month. This includes your housing and food costs, travel, insurance and any expenses you need to work, such as internet access or a cell phone. If you have credit cards, student loans or other debts you're paying on, include those as well. Saving should also be a priority in your budget. If your income fluctuates, an emergency fund can help cover your expenses when needed. It can also help pay for larger expenses if you get hurt or sick while you're traveling. Finally, review your non-essential spending. That covers things like clothing, entertainment and dining out. These expenses should be added in only after you've budgeted for your basic living expenses, savings and debt repayment. Ideally, your budget should cover all of those things and still leave you with money left over each month. But if not, you'll need to review each of your expenses to see where you can bring your spending down. Having an emergency fund matters if you're a digital nomad but you also need to think about saving for retirement. If you're a freelancer, independent contractor or business owner, an employer's 401(k) isn't an option so you'll need to consider how you can save on your own. A traditional or Roth IRA is an easy way to get on the retirement savings path, while enjoying some tax benefits. A traditional IRA allows for tax-deductible contributions while a Roth IRA gives you the advantage of tax-free withdrawals when you retire. You could also consider a SEP or SIMPLE IRA or a solo 401(k) plan. SEP and SIMPLE IRAs follow the same tax rules as traditional IRAs, although they do offer the advantage of higher annual contribution limits. A solo 401(k) is designed for sole proprietors who don't have any employees, other than their spouse, and of the three it has the highest annual contribution limit. Go back to your budget and determine how much you can save for retirement each month, then commit to saving that in a tax-advantaged plan regularly. Automating contributions is the easiest way to grow your retirement wealth. Remember to review your investment choices at least once per year to make sure they still fit your goals and risk tolerance. Also, review the fees you're paying for individual investments to make sure you're maximizing your account's earning potential. While some digital nomads spend all their time traveling, you may only plan to be away part-time. If you own a home or you're renting, you'll need to think about where those expenses fit into your budget. For example, if you'll be gone six months out of the year will you sublet your rental or list your home on Airbnb while you're away? If not, you need to be sure that your budget will allow you to pay your mortgage or rent payment, plus things like utilities, property taxes or renter's insurance, along with your other expenses while you're away. Think also about the tax implications of working on the road. If you're spending part of the year outside the U.S., you should know that income earned abroad is still taxable. That means you're still responsible for paying income tax and estimated quarterly taxes if you're self-employed. The Foreign Earned Income Exclusion allows eligible taxpayers living and working in foreign countries to exclude part of their income, up to certain limits. However, if you're self-employed, this exclusion only reduces your income tax and not your self-employment tax. The upside is that you can deduct expenses for housing when living in a foreign country. If you're living in a foreign country part of the year or traveling to different countries regularly, you need to be able to access your money. As a digital nomad, the easiest way to pay for things may be using a credit card that charges no foreign transaction fee, then paying the balance in full each month. But, if you think you'll need cash or you prefer to use a debit card for certain purchases, you may want to rethink where you bank. If you currently have accounts at a smaller community bank, for example, you may want to consider opening a checking and savings account at a bank that has a global network of branches and ATMs. Something else to consider––currency conversion fees. If you're swapping out U.S. dollars for local currency at a bank, remember to factor in what you'll pay for the conversion, and what the exchange rate is for your money.